In the heavy lift truck sector, as in many other machinery markets, a healthy second-hand sector is essential for the vitality of original equipment sales. Buyers of new machines may rely on the residual value of equipment they are replacing, in the form of trade-in or sales to third parties, to reduce the cost of the new investments. At the same time, there are always operators who prefer to source second-hand rather than new. Their throughput may not justify new machinery, for example, or the application may be of temporary or uncertain duration. By its very nature, the used equipment market is the “hidden” side of new machinery sales, but it is also very diverse in terms of end user profile and geographical scope. It is also multi-channel. End users may buy and sell directly between themselves, particularly if they are in the same or nearby location, or part of the same group; the equipment may be a trade-in, so the OEM or an OE dealer or distributor is the buyer and then the seller; or the equipment may be traded through an independent used equipment specialist. The latter course perhaps offers the most opportunities, because there is an added entrepreneurial incentive to maximise business. Successful traders require market knowledge and contacts to identify and access suitable equipment. Equally, their sales depend on the trust and confidence of prospective buyers. 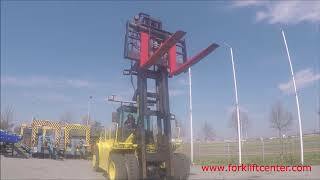 Originally a trading company focused on small FLTs, in the past few years Netherlands-based Forkliftcenter (FLC) has developed into a major player in the used heavy truck sector, with customers in the ports and intermodal sectors worldwide. Privately-owned and managed, FLC has a 26,000 m2 facility with a large showroom and outdoor test area in the Amsterdam port area. It has sales and support offices in Belgium, Germany, Dubai, Australia and (opening soon) Panama. Currently, FLC has a presence in almost 90 countries. In the past 5-10 years, its turnover has grown at around 20% annually, easily outstripping the sales curve of the overall big trucks market. 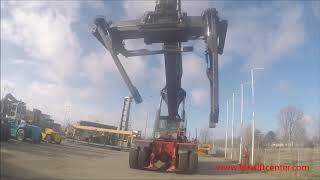 At any one time, says FLC’s CEO Bjørn André de la Porte, FLC will have in stock for sale at its Amsterdam facility 25-40 reach stackers, 15-20 EC mast trucks and 20-25 heavy (12t-46t) FLTs, along with 180-250 small FLTs (1t-7t) and 20-30 terminal tractors, trailers, goosenecks, and so on. Such a large used equipment fleet is very unusual and may be unique in the ports/intermodal sectors. The available reach stackers cover the whole spectrum from 6m to 7m-plus wheelbase machines, with or without front support pads, and with SWLs from 41-27 and 41-31 through 45-31 and 45-35 to 45-42 at the top end. It has dealings with most OEMs, certainly in Europe where it sources 95% of its purchases. “The challenge is always to have the full range available in a mix of different brands,” says André de la Porte. “We think this is unique in terms of customer choice. “We buy mainly from the OEMs and we often know the history of the machine” he continues. “A common source is machines that have come back early from lease, or after a 5-year lease has expired and/or the operator wants to trade in for a new machine.” FLC carries out a survey of every machine and knows its history in terms of operating hours and maintenance record. Machines are tested, checked and cleaned before being put in the showroom. Prospective customers are provided with a comprehensive status report and have a choice of buying the machines “as seen,” or having them serviced and/or refurbished by FLC before they buy them. In all cases they are advised of critical factors to watch out for in future, and when new components or parts will likely be required. Training is available for the customer’s own maintenance and service staff if, for example, they are unfamiliar with the brand. The sale price is usually around 50-60% of the price of an equivalent new machine, although one has to be careful not to generalise. If, say, a reach stacker requires six new tyres, that could add as much as €20,000 to the price (for 18.00- 25 covers). As already noted, paying a lower price mitigates the risk when the customer is unsure how long the machine will be required. Similarly, if a machine is required to operate only 8-10h/day, buying new may be uneconomical. Sales at the fore Sales are FLC’s core business, although it also rents machines in certain European markets, such as Benelux, Germany, France and the UK. Currently there are around 35 big trucks in the rental fleet. FLC recognises that to be credible in the rental market, it has to be able to provide comprehensive service support. This is obviously easier in relative proximity to Amsterdam and it is also easier to control the financial risk in Europe. Another reason for keeping the rental market “close to home” is that contracts can be very short, for example to cover a “spike” in container throughput, so a machine that goes off-hire needs to be got back quickly. Sometimes, a machine is rented as a “bridge” on behalf of an OEM due to the leadtime between order and delivery of new equipment. This is another example of the cooperation between FLC and the OE sector. 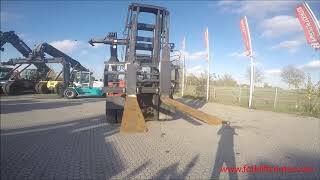 To support its sales and rental activities, FLC carries a stock of attachments such as spreaders and forks, tyres and rims, and even spare booms. It does not stock driveline parts or components, but works closely with the relevant manufacturers and suppliers. André de la Porte adds that FLC can and will send its mechanics from Amsterdam worldwide to fix problems if the customer cannot solve them locally. 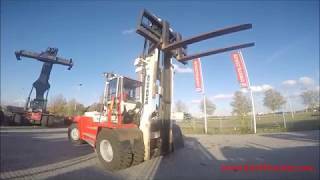 Parts can be shipped anywhere from Amsterdam Schiphol airport as required at short notice. FLC is that it has its own in-house shipping department, which has close links with shipping agents in the Netherlands and Belgium. Machines can be shipped practically anywhere cost-effectively, using container shipping rates and the flexibility of container distribution. Reach stackers, for example, are broken down by FLC’s own cranes into two 40fts for all sub-assemblies, and a flatrack for shipping the bare chassis and reassembled on delivery. FLC can also arrange local storage of equipment through its existing facilities in Dubai and Australia. Initially the new Panama office will focus on building sales in the Americas, where FLC already has customers. Crucially from FLC’s perspective, the new Panama channel puts it in the same broad time zone as Americas’ customers and it also opens up new possibilities for OEM contacts.